[By Nick] ‎I'd like to start this review by apologizing to Belfonte. They sent me three free containers of ice cream right before I started to move and they never made it with me for some odd reason. Thankfully after a recent trip to visit family, I was able to recover these containers and brought them to their proper home. Now without a further ado, let's look at a flavor I don't think we've ever reviewed on the blog before. 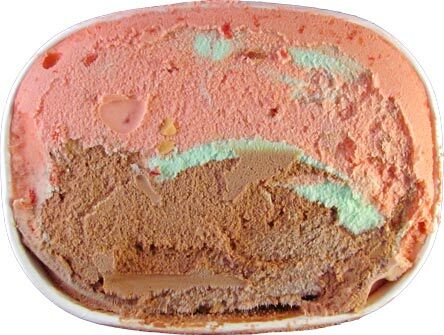 Spumoni has always been a flavor to catch my eye but my aversion to green ice cream and never trying pistachio until a year ago kept my curiosity at bay. Heck, I don't think I'd actually pick it up on my own if it wasn't for their shipment. 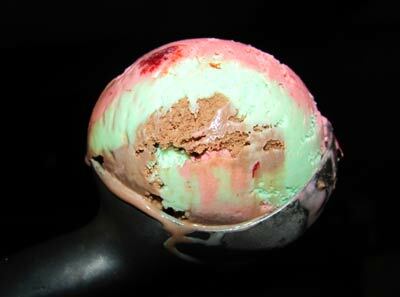 Spumoni is traditional cherry, chocolate and pistachio ice creams with various ‎fruits and nuts mixed in. In the case of Belfonte's, we have almonds and pistachios making up the nut portion with quite a list of interesting fruits. There's black cherries, grapes, pineapple, apples, cranberries, raisins and even peaches all in the mix. This might be the first time I've ever had an ice cream that's contain either grapes, raisins or even cranberries. They just seem odd to me but then again, I do know of some pb&j ice cream properly using grape jelly so it only leave the raisins and cranberries that could possibly make for a very strange experience. Opening this one up, each ice cream is represented with chocolate taking up the majority of the visual. That trend continues with chocolate easily controlling over half of the container space with the pistachio and cherry fighting for the remaining space. Since this is the first time having Belfonte on the blog, let's talk about the texture and consistency. This is one of the denser mainstream ice cream creams I've encountered. I'd put the quality on par with Blue Bunny and just a bit better than Turkey Hill, to give you all a point of reference. Definitely not a low grade ice cream by any means. Since the chocolate ice cream is the most prevalent, let's start there. ‎The flavor is more of a milk chocolate. It's not flat like some milk chocolate can be and has a very addicting quality to it. It's one of the better chocolate bases I've encountered from this kind of company. Since there's nothing mixed into it like the other bases, there's nothing really else to comment on it though. The pistachio reminds me a lot of Ben & Jerry's in the flavor of the base. It has a sweet, cookie like flavor with just a bite of saltiness from the nuts that contrast well with the milk chocolate base. The nuts are hit and miss. While the almonds tend to keep their crunchiness, most of the pistachios are on the soft side. While it's not a real big deal to me since I enjoy the contrast in textures, i'm sure others might not be too fond of it. Last up is the fruit laden cherry ice cream. Sadly, the cherry is the weakest of the bunch mainly because the actual cherry flavor is mild. It's just a general fruity vibe going on. 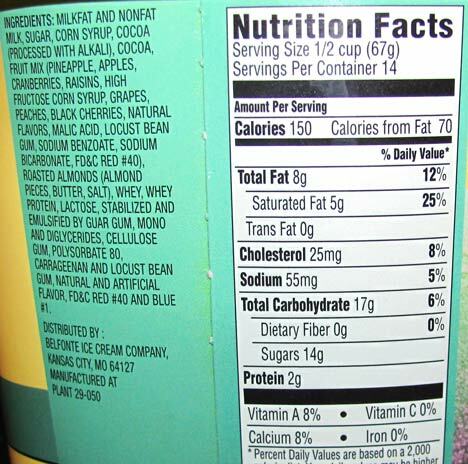 I'm not sure if that's due to all the various fruits included but there's no real prevalent flavor other than fruity. The bits of fruit don't add much besides some texture here and there. As a whole though, this is quite the tasty flavor. I can see why they decided to fill it with so much chocolate ice cream now. Not only is it the best of the three, it's complimented by the other bases well. The saltiness of the pistachio and the fruitiness of the cherry bring out the darker qualities of the chocolate base and lead to a great bite when everything is on one spoon. 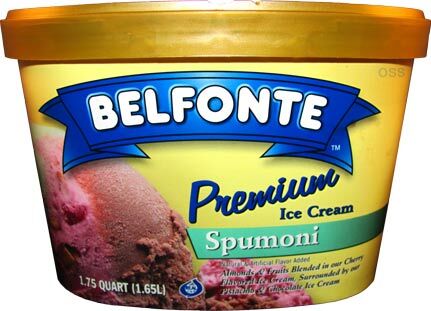 Belfonte has definitely opened up the door for future Spumoni reviews after how well this one went over with me. They also sent me two other containers so be on the look out for those reviews in the near future. I'm glad to see a good Spumoni review. It's not an easy ice cream to do well.... to me, formulating the right mix of ingredients for each flavor is a lot like cracking a safe. Not that I know anything about cracking safes, mind you. Now that we have that awkward pause out of the way... I say that there seems to be only one right way to make it. 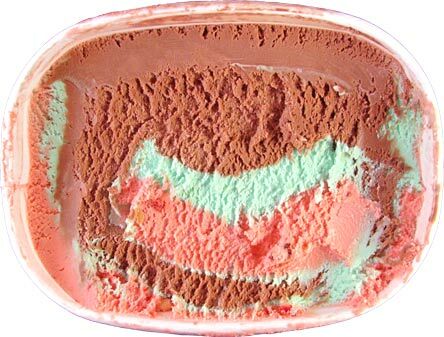 Where can I order a case of your Spumoni ice cream? I can't find it at any store in Lakeland, Fl. Can I order it for delivery?